The Public Works Department of Delhi has proposed turning an east-west corridor into a dedicated 20-kilometer corridor for buses. Delhi has a pilot bus rapid transit system in place that EMBARQ, the producer of this blog, evaluated for improvements. Turkey plans to build nearly 100 new high-speed rail stations across the country. Three are planned for its capital, Ankara, and the construction of additional stations will begin after high-speed lines are built in a network of cities. In his State of the City speech on Wednesday, New York City Mayor Michael Bloomberg will roll out a proposal to change taxi rules to make it possible to hail informal cabs in the outer boroughs. The plan would greatly increase the number of cabs available, but many cab drivers are up in arms, saying the change would cut into their fares, particularly for drivers who pay high fees to rent the iconic yellow medallion cabs. According to the annual Texas Transportation Institute survey, Washington, D.C. tied with Chicago for having the worst congestion and traffic in the country. Things have gotten better since 2007 when the average time spent in traffic was about 85 hours, which amounts to about 57 gallons of gas. U.S. Secretary of Transportation Ray LaHood “reaffirmed that distracted driving will remain front and center in the [Department of Transportation’s] safety campaigns.” Plans to improve safety will include the improvement of car crash performance and safer roadway design. Public transit riders are six times more likely to suffer from acute respiratory infections; occasional riders are most at risk, according to a recent British study. Edmonton, the only city in Canada that doesn’t allow alcohol advertisements on its buses and rail, wants to overturn a long-standing ban on transit ads for liquor. Experts estimate the overturn would generate an extra $1 million dollars a year for the transit system. China’s epic traffic jams have benefited enterprising village residents who sold their food to stranded travelers at a 500 percent markup this week, reported The New York Times. China plans to install 10 million electric vehicle charging stations by 2020. A report by the Central Pollution Control Board (CPCB) of Pune, India expressed concern over air pollution in the city and called for raising the standards of road infrastructure and public transport. Two of Canada’s leading think tanks released a new report that shows that smog in the Greater Toronto and Hamilton Area could be reduced significantly by moving car commuters to rail, such as LRT and subway, and freight trucks to freight trains. Nearly every large North American city has a phantom highway: an unbuilt or torn down expressway that influenced the trajectory of development in one way or another. Caribou Coffee redesigned its bus shelters in Minneapolis, Min. 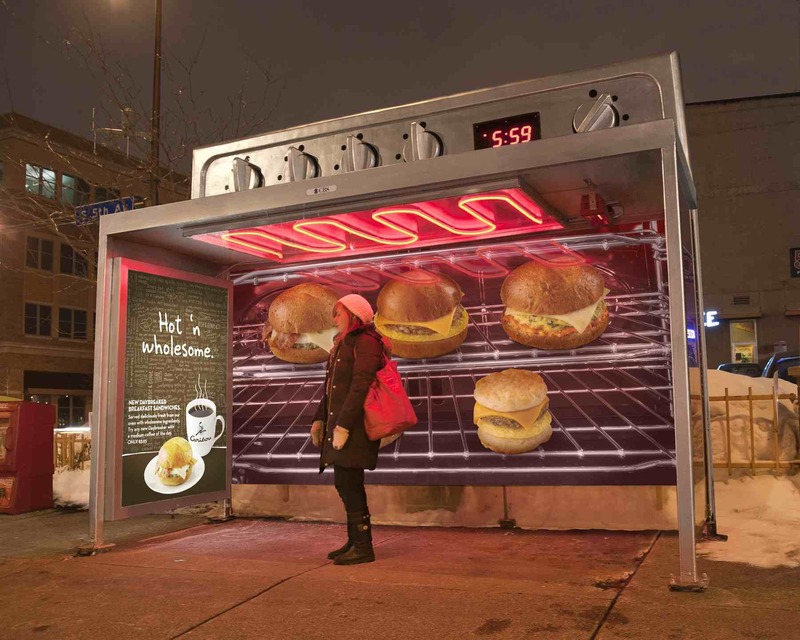 to look like ovens as part of an ad campaign to promote their new breakfast sandwich. What can the U.S. learn from Europe’s restrictive parking policies? A new report from the Institute for Transportation and Development Policy explains how Europe is making parking less convenient, causing people to drive less and shop more. Chrysler is partnering with the U.S. Environmental Protection Agency to develop a new minivan that doesn’t use batteries or electric motors but instead uses pumped-up hydraulic fluid. Toyota is developing a car battery that doesn’t use rare earth metals but is instead lighter and more efficient. Subaru, Honda, Hyundai, and Mitsubishi all have plans for new electric and hybrid cars.